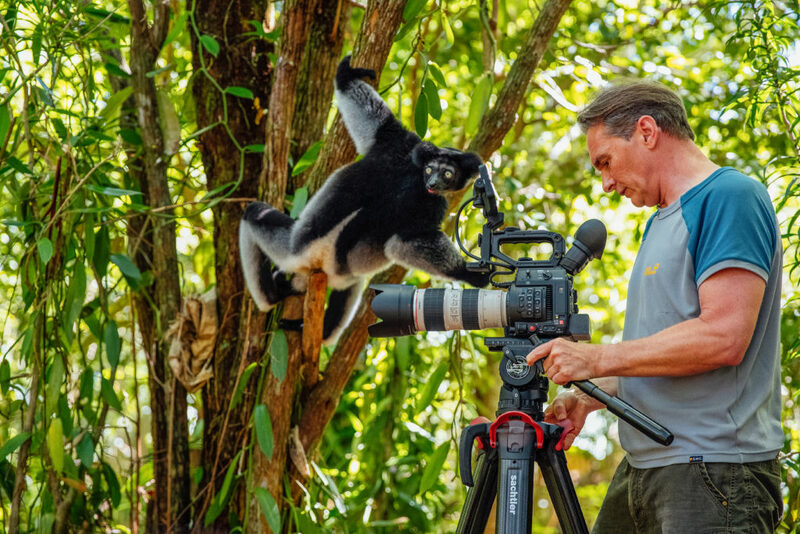 AMSTERDAM — Sept. 12, 2018 — Renowned nature and wildlife photographer Thorsten Milse has embraced the all-new flowtech100 carbon-fibre tripod after successfully testing it on a recent six-week trip to photograph the famed lemurs of Madagascar. The flowtech100 was officially launched at IBC2018 today by Sachtler and Vinten, both Vitec Group brands and global industry leaders in camera supports for over 100 years. Compatible with all major 100mm fluid heads, flowtech100 is the latest addition to the award-winning flowtech carbon-fibre tripod range. The new tripod supports a payload of up to 30kg (66lbs), making it ideal for a wide range of wildlife, commercial, and documentary productions, as well as heavy-duty electronic newsgathering (ENG) and electronic field production (EFP). On the Madagascar expedition, Milse loaded up the flowtech100 with a Sachtler FSB 10 fluid head and his Canon EOS-1D X Mark II camera, equipped with a heavy 600mm zoom lens. Like flowtech75, the first tripod in the flowtech series, flowtech100 is based on an exclusive carbon-fibre technology that includes the world’s fastest-deploying tripod legs. With unique quick-release brakes conveniently located at the top of the tripod, the flowtech100 legs can be deployed simultaneously and adjust automatically to the ground’s surface — saving operators from having to bend over and manually adjust multiple brakes on each leg. Another valuable flowtech100 feature, especially for photographing wildlife, is the tripod’s ability to adjust almost instantly to heights ranging from 26cm to 153cm. Milse also used the flowtech100-FSB 10 setup to shoot video footage using a Canon EOS C200 digital cinema camera. For video, he was able to snap on the flowtech100’s mid-level spreader for even greater stability. “With a 600mm lens, you need really good balance between the lens and the camera. The flowtech100 and FSB 10 were the perfect combination, offering a firm platform for my expensive gear and the stability needed for precision shooting with such a long lens,” he said. The flowtech100 tripod can now be pre-ordered from authorised Sachtler or Vinten resellers and will be shipped Oct. 1. The MSRP of the new flowtech100 is $3,450, £2,550, €2,900, and ¥414,000. Sachtler®, founded in 1958 by cameraman Wendelin Sachtler, is a worldwide market leader in professional camera support systems for cinematography and television production. The Sachtler name has been a symbol of top quality and reliability for decades, and the company’s extensive range of camera support systems and finely modulated line of reportage lighting products make Sachtler a highly qualified partner for broadcast and film applications. Sachtler is part of the Vitec Group. For more information, visit www.sachtler.com. Vinten®, a Vitec Group brand, is a leading provider of manual and robotic camera support systems. Customers rely on Vinten’s engineering excellence and globally supported solutions for a wide range of technologies and markets. Founded over 100 years ago by William Vinten, the Vinten brand is still based on its founder’s guiding principles of highly innovative design and extreme precision in manufacturing. Offering a best-in-class range of products that includes manual supports, robotic heads, pedestals, and controllers, Vinten is the premium solution for studio and outside broadcast. With over 80 registered patents, Vinten frees the camera operator’s creativity by making camera operation effortless. For more information on Vinten, visit www.vinten.com. Photo Caption: Wildlife photographer Thorsten Milse with the new flowtech100 tripod.